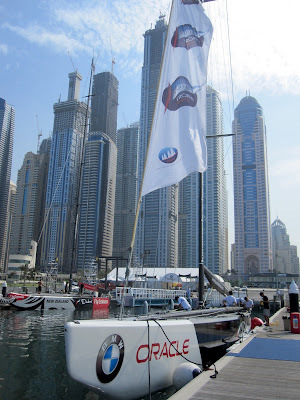 The sailing team for BMW ORACLE Racing has been in Dubai for a couple of days now, getting in some advance training ahead of the Louis Vuitton Trophy regatta which starts on Sunday. Five of the six competing teams are now in town, meaning the team is able to line-up against some competition for training. On Monday, the practice sessions were curtailed slightly early due to a sandstorm - a new experience for most of the crews. BMW ORACLE Racing docked out just after noon today, putting in a full afternoon on the water in an effort to be ready once racing starts. The team hasn't had great results at the previous Louis Vuitton Trophy regattas, but is looking to change that at this final event in Dubai. "We always want to win," says Brian 'Puck' MacInnes. "Our focus has been in other places recently, but hopefully we can come out with all cylinders firing here." Conditions have been ideal this week, with a steady sea breeze filling in around noon, and lasting until the light fades just before 1800. "I hadn't sailed in Dubai until now, but it's been beautiful. 12 to 14 knots of wind, steady, nice and warm. Good for racing." 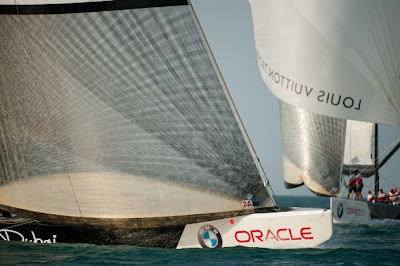 Apart from the sailing team, BMW ORACLE Racing is supplying two of the four boats being used in the event, along with a shore crew and sailmakers - some 20-plus people - to keep the boats in top racing condition. This is likely to be the last event where the old America's Cup Class boats are used in competition. MacInnes, as a grinder, has a pivotal role on the ACC boats, but he's keen to make the switch to the new AC72 catamarans. "I'm looking forward to the new catamarans, which look to be very exciting," he says. And he's not worried about losing his job: "I think the new AC72s are going to be even more physical than these boats. They'll have similar righting moments, bigger sails and only 11 people on board, so I think there's going to be a lot of grinding." Racing in Dubai starts on Sunday. Full regatta format and schedule is at the event website, www.louisvuittontrophy.com.